If you are planning your holidays to Ibiza the following information may help by giving you an overview on this popular Balearic Island and help you in selecting from our range of accommodation. Ibiza is the most southern of the Balearic Islands [with the exception of Formentera] and approximately 80km from mainland Spain. Why not hire a car on your Ibiza holiday? It’s a very small island and hiring a car for a few days will enable you to see most of it. With the high level of tourism and the club scene filling several of the towns and most of the beaches in Ibiza, it could be easily assumed that peace and quiet were the hardest things to find on a holiday to Ibiza – but just walk away from a crowded beach for a few minutes and you will be on a deserted section of coast, or drive a few miles from any town and you will be in countryside that seems to have been untouched by time. There seems to be several Ibiza’s – each distinctly different. At the island centre is Eivissa – the capital [known as Ibiza Town] to visitors]. 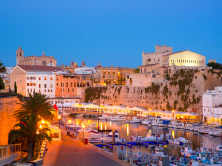 Even here there are several different towns – the old walled city of D’alt Vila with its trendy shopping area near the harbour, and the new town where more elegant shops and pavement cafes stand among the offices. For many people, Ibiza holidays are about the beaches. Tucked into a sheltered fold on Ibiza’s southeastern coast, this is one of the islands loveliest bays – Cala d’Hort. To reach the bay, turn off the main road from Es Cubells to Sant Josep, and then to Cala Vadella. Cala d’Hort is exquisite, its 200m beach framed by rocks and with a backdrop of steep cliffs and pine trees. 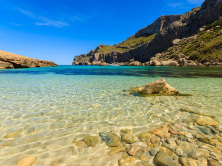 If possible, try to stay until sunset as Cala d’Hort faxes west and the sun dying into the Mediterranean horizon is another reason for the bays popularity. The view from the cliff-top car park above the bays southern end is one of the best you will find. Of course, you will not have the bay to yourself – nothing this idyllic could remain a secret. For lunch try the bays restaurants. The fish dishes are worth considering, with fish being caught from the beach, making it as fresh as it is possible to be. On the other side of Eivissa [Ibiza Town] from Talamanca this beach is long but not as well kept as Talamanca, with its promenade being its best feature. A continuation of Ses Figueretas and almost 3km long. This is a package-holiday resort and so tends to be crowded, but with its palm trees is very attractive with excellent facilities. A small beach in a cover with excellent facilities including a diving school. A long sandy beach ideal for children with excellent facilities including a diving school. There are several bays close to San Antonio. Cala Comte is small but has reasonable facilities. Cala Bassa is much larger and has excellent facilities. Port des Torrent is small but has excellent facilities. Cala Grassio, to the north of the town, is very small and surprisingly quiet, but facilities here are limited. Cala Salada, the next beach northwards, is larger and offers good swimming, but has limited facilities. Close to Puerto San Miguel and very popular with the locals. Sand and rocks and limited facilities. There are several beaches here, all with excellent facilities. Just to the north of Cala Mastella, this very pretty cove has curiously coloured greenish sand but is excellent for swimming. Reasonable facilities, but difficult access for visitors with disabilities. There are plenty of opportunities for shopping on your Ibiza holidays. About 25 years ago a specific form of fashion grew up in Ibiza. Known as Ad Lib, the fashion has withstood the test of time and has event influenced world-wide fashion. The shops selling Ad Lib on Ibiza come and go frequently as young designers move in for a season or two and then move on. There is a huge array of shops selling Ad Lib [although some would frown at being called Ad Lib]. You can also shop in the main resorts for antiques, paintings and sculpture, ceramics and pottery, clothing a shoes, embroidery, jewellery, knitwear and leather. Wherever you decide to go on your holidays to Ibiza you can be assured of sun. On average, Ibiza has 300 days of sunshine each year and in summer there is an average of 10 hours every day. Ibiza holidays offer a varied dining experience. The cuisine of Ibiza reflects both its varied history and the impact of tourism on the island. It is therefore possible to find a traditional menu along with fish and chips and a pint of beer – the latter served in an “authentic” pub. Generally speaking, cuisine is similar to that of mainland Spain, intermingled with dishes of its own. It is based mainly on fish from the surrounding sea and checked and game birds. Gazpacho, an Andalucian soup thickened with bread and highly flavoured with peppers, onion and garlic, and served chilled, is very popular, as are tortillas [omelettes] and paella, with the Ibizan version known as arroz or arrosec which has meant [usually rabbit] and vegetables as well as fish and shellfish. In addition to gazpacho, Ibiza offers several good fish soups – try bullit de peix or sopa de rap, which is made with monkfish. Guisat de peix, is a fish-based stew, while guisant de marisc, is similar, but chiefly uses shellfish. For a speciality fish dish, try burrida de ratjada, skate with sauce that usually contained crushed toast and almonds. Often garlic is added to the sauce, though the fishs delicate flavour does mean that it survives very well without. Tonyina al Eivissenca, is a particularly ibizan tuna dish, the fish being served in a sauce of pine nuts, eggs and white wine. Other worthwhile fish dishes are made with salmonete [red mullet], mero [grouper], and mejillones [mussels]. Favourites include safrit payes a filling stew of chiken and goat seasoned with garlic and the Ibizan speciality of coles a la Ibicenco, a stew of pigs ears and cabbage. For dessert, try ensaimada, the typical Ibizan cake of light pasty filled with cream or almond paste and sprinkled with sugar [these are also served at breakfast]. Orietas, an aniseed cake, or flao, a cheesecake flavoured with mint. Wine made on the island of Ibiza can sometimes be found in restaurants [look for vino de páges, but is more usually restricted to bars frequented by the locals. Island wine is red and is usually described as full-bodied. 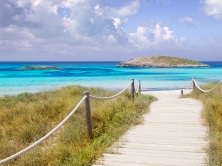 The Balearic Islands are famous for their herb spirits. Hierbas, is herb-based – usually thyme, known locally as frigola, although other herbs are used occasionally – while ains is aniseed-based. For some people a holiday in Ibiza is about clubbing. The island of Ibiza has one of the best club scenes in the world. The venues, massive capacity places where thousands have been spent on the interiors, are not equaled even in London. Best DJs are flown over throughout the season, resulting in high quality music in beautiful venues with crowds that always seem to want more. Most of the clubs cater for the English tourist, although others like El Divino and Pacha, may have more of a European crowd. It is the promoters and their DJs that make a night, not the venue. The most popular places normally have one big night of the week, which changes from season to season. Check posters and flyers and any of the free magazines for up-to-date information. Entrance to clubs is expensive. The price often includes a free drink, which you will want to use, as even a bottle of water is exorbitant in some places. Foam and water parties are a bit of an Ibiza institution. The foam or water is released from the ceiling to soak the people on the dance floor whose reaction can be anything from skidding to stripping. The dance floor at Es Paradis actually fills with water and becomes a swimming pool.